It has been a few years since we have been able to really enjoy this, but the last week or so it has been freezing hard. The ice has finally hit safe thickness and we went out to give it a try on New Years Eve. 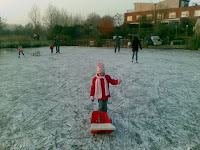 They are predicting that it might freeze hard for another week at least, so who knows we might even get to see an 'Elfstedentocht' this year (their 100 year jubilee is 15 Jan 2009). 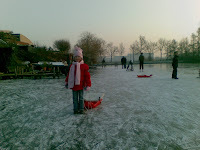 My little girl and I ran about while sleding and laughing with the other kids. Life can sometimes be really good!